Entries categorized "The Paper Loft"
The Paper Loft and CardMaker Magazine Blog Hop! Welcome to the CardMaker and The Paper Loft Blog Hop! Today the CardMaker Designers and The Paper Loft Designers will be showing you wonderful projects featuring papers from The Paper Loft. For my project, I chose to make a journal using the Great Outdoors patterned cardstock collection. The base of my project is a Maya Road Binder Book, with 6"x6" pages. I kept the embellishments all very simple, and user friendly! A few leaves, a banner, and a button threaded with hemp twine keep things easy. Like videos?! You're in luck! I made one, sharing this journal in more detail. Enjoy! I encourage you to enjoy today's hop! Make sure to comment on each of the blogs in the hop. One winner will be randomly chosen to win a $25 Gift Certificate from The Paper Loft! The winner will be chosen on August 31st at 9pm CT and announced on The Paper Loft Blog on September 1st. Yay for weekends! I ran up to the grocery store this morning, then came home and took a nice, long nap. A much needed nap! And I thought I'd share this cute little "celebrate today" card. For the layout of my card I used mini templates from Kiwi Lane Designs and papers from the On the Go line from The Paper Loft. Hope you celebrated a little today! Even with something as simple as a nap! Stamp: Cheers to You cling mount set from Whipper Snapper Designs; Stampin' Up! I love this bear. He is one of my all-time favorites, and I'm so glad he's been sitting on my desk for the past few weeks. He was included in the Campy Matchbook Notebook project I did a few weeks ago, and was calling out to me as I was playing with The Great Outdoors paper line from The Paper Loft. Imagine a hug from him! Jeepers! For the layout of my card, I used mini templates from Kiwi Lane Designs. I saw them recently at a convention near Dallas that I attended. I liked the fun wavy lines of the Thoughtful templates, which turned out to be great for creating whimsical scenes! It's Tuesday, and time for a new High Hopes blog challenge! Ribbon and/or Twine is our theme this week, so pull out your High Hopes images, and join us! For my card I chose to make a cute summery scene, with a simple button/twine embellishment. The Fishing Friends image is stamped in black StazOn ink and watercolored with Albrecht Durer watercolor pencils. I love the dog in this image! So cute! The patterned paper is from the On the Go line from The Paper Loft. Find all the details of this week's challenge on the High Hopes blog. I hope you join us! A new challenge is being shared today on the Impression Obsession Blog, and I hope you join the fun! The challenge is Are We There Yet (Travel Themed). Pull out your creativity, and join us! I chose to create a beachy card, since the beach is one of my favorite places to go. 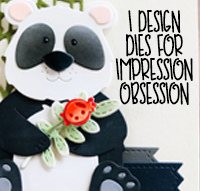 Find all the details on how to enter the challenge on the Impression Obsession Blog. A random challenge entry will be selected to showcase on the IO blog and you can to enter to win a $25 gift certificate to IO just by playing! It's Tuesday, and time for a new High Hopes blog challenge! Pastel Colors is our theme, so pull out any High Hopes images you have, and join us! It's Tuesday, and time for a new High Hopes blog challenge! Dots and Spots is our theme, so pull out any High Hopes images you have, and join us! I have this fun matchbox project being featured on the Sizzix blog today! Check it out! Complete with fly fishing flies made by my Dad! How about putting a little "more" country on the country cottage house! I used the Sizzix Biz XL Country Cottage 3-D die to create a little chicken barn, complete with grain silo! I had the best time making this project! I used some corn button embellishments to decorate the ends of the coop. I placed little brown brads on the door of the coop and the silo for door knobs. Using one of the shutter dies, I created a little sign to hang above the door... "The Coop". I even used chickens from a couple of my Whipper Snapper cling mount sets to create some stand-up chickens for the yard! They were stamped on watercolor paper, colored, fussy cut, and a little tab at the bottom of each was slipped into a slit I made in the base of the cottage to allow them to stand upright. When I adhered the coop onto the base, I placed it at a slight angle, allowing me a bit more room at the front of the cottage for the chickens. I decorated the top of the coop with a cute rusty star, antique mother of pearl button, and a little handmade "fresh eggs" banner. I created the grain silo by wrapping The Paper Loft's designer woodgrain paper around a standard cardboard tissue roll. For the top of the silo, I die cut a scalloped circle and using scissors, snipped to the center of the scalloped circle so that I could form the circle into a cone shape by overlapping some of the scallops. A healthy addition of dry Distress Glitter to everything really sparkled up the place! I hope this little coop provides you with a bit of inspiration! I know I can't WAIT to make more fun themed cottages! I've got quite a little collection started! The current High Hopes challenge is Birthday! I chose to use the new Froggy Stack image and made a "hoppy birthday" card. I stamped the image on Fabriano watercolor paper using black StazOn ink and colored it with watercolor pencils. I added Glossy Accents to the image on select areas for shine. Don't they look like they're having fun!? I've used the February The Paper Loft sketch challenge for my layout. Find the sketch challenge details here. My final card for this week's High Hopes sneak peek and release was made with the new Happy Sunflowers image. I stamped the image on heavy watercolor paper using StazOn black ink and colored the image with Inktense colored pencils. I used a water brush to blend out the colors of the pencils. Those are some seriously happy sunflowers, if you ask me! The banner area of the stamp comes blank, so you can add your own sentiment. I chose to use one from one of my Whipper Snapper cling mount sets called All Things with Love. I added a Dress It Up sunflower button to one side, and slipped a couple of paper leaves under the flower. Pretty simple! Find all the details of this week's release on the High Hopes blog. The High Hopes designers are doing a few sneak peeks this week, using images that are being released on Wednesday of this week. For today's project, I've used Herbie's Heifer along with the Barn image to create this country scene. I recommend popping on over to the High Hopes blog to check out the rest of the team's peeks for today! Fun stuff! A new challenge is being shared today on the Impression Obsession Blog, and I hope you join the fun! The challenge is a color challenge, and the color is Blue. I chose to use the Heart Brush and You Are Beautiful sentiment image on my card. I stamped the sentiment in black StazOn ink on heavy watercolor paper. I added a wash of blue, adding spots here and there as it dried. I stamped the brush on watercolor paper and hand cut the image. I wrapped the brush with twine and adhered it to the card. I added a heart shaped gem over top of where there is a heart on the handle of the brush image. Finally, I adhered the painted and stamped image to a base of Neenah cardstock layered with patterned paper from The Paper Loft's Island Sun line. The current High Hopes challenge is Embossing (heat or dry). I chose to use the cute Downhill Snowy for my card. The lovely papers I chose to use on the background are from The Paper Loft, from their recently released Island Sun collection. I thought the pretty blue and white print would work nicely for a wintery greeting. Find all the details of this week's challenge on the High Hopes blog. The current High Hopes challenge topic is to use your Favorite Embellishment! For me, that's buttons! For my project, I chose to use one of the new holiday images called Christmas Pals. There is a challenge currently being hosted by The Paper Loft where one participant will be chosen to be a guest designer for The Paper Loft! Play along! You can find all the details on The Paper Loft blog. I thought I'd use the sketch to make a fun Halloween card using this Recolections image. I used a couple of papers from the Funkysarus paper line -- which might just be my favorite Paper Loft line! I love the warm colors, and the fun prints. If you have a little time this weekend to craft, use the sketch challenge for inspiration! Your challenge entry doesn't have to be a scrapbook layout ... cards are welcome, too! High Hopes Challenge: Anything Goes! The current High Hopes challenge topic is Anything Goes! Sounds like a good time to pull out a chicken stamp, don't you agree!? There's a new sketch challenge posted on The Paper Loft blog, and I thought I'd play along! I used papers from the Huckleberry Pond 6x6 paper pad, and a fun fishing hat stamp from Stamps by Judith. The image is stamped in black Memento ink, and colored with Touch Twin markers. Quick and easy! Coffee and tea are popular subjects these days (and not just in papercrafting), so I was excited to see The Stamps of Life release dies that coordinate with their coffee themed stamp set. I put together a few projects using the new dies, and thought I'd share them with you! First, I made a treat packet using a glassine envelope. I put chocolate covered espresso beans inside, folded down the opening of the envelope, and added a paper band around the bag to keep it closed. I used the coffee cup die to create a small gift card that I added to the front of the treat packet. The backside of the coffee cup shaped gift card is just slipped underneath the paper band that wraps around the bag of treats. The paper band holds the coffee cup card in place, and the card helps decorate the front of the treat bag. Yummy!! Yes, please! I also made this card, using the negative shape of the coffee cup die. Using different patterned papers with the die made this card super easy to make! The coffee die set also comes with the itty bitty coffee cup die I used on the circle charm. I cut it out in chocolate brown paper and added a cute antique button to the center. And finally, I also made this card using the label die from the same set of dies. It's a great shape, and will come in handy for all kinds of fun projects! And speaking of coffee .... if you're a coffee drinker, what's your favorite brand and roast? All of us here on the farm wish you luck and happiness on this fine St. Patrick's Day! We won't be having any green beer today, but we certainly will enjoy some green-shelled farm fresh eggs! And I think that's pretty fun! And speaking of eggs, are you keeping up with the daily egg count? Paper: The PaperLoft, Fabriano Watercolor Paper, Stampin' Up! The Challenge Chicks: It's Not Easy Being Green! 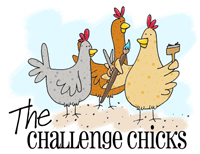 If you're a stamper and you like challenges, or you're new to the idea of challenges and want to give one a whirl, I invite you to participate with The Challenge Chicks! We're a small group of friends and stampers hosting monthly challenges. Won't you join us?! Our challenge for March 2013 is being shared today: It's Not Easy Being Green! I chose to re-purpose a few items and made something that gives my selected items an entirely new purpose! For my project I used the cardboard core from a roll of packing tape, a wooden lid from a jar candle, and chipboard from a box of Alan's favorite fiber bars to create this little "masculine" themed container. I covered the packing tape core with paper from The Paper Loft. The base of the container is made from two scalloped die cut circles (adhered together) from a fiber bar box. The lid from the jar candle fit PERFECTLY inside the packing tape core. This will be fun to fill with little chocolate goodies, or even a small gift for a birthday or Christmas! And, finally, you'll find this month's challenge gallery on SplitCoastStampers using keyword CHXMAR13. We invite you to play along! Upload your project to your SplitCoastStampers gallery, add the keyword above, and your project will be automatically added to the gallery. Or join us on Facebook! I chose to use this older stamp from my collection. It's an All Night Media image, and one that I just adore. I stamped the image in Memento ink and colored it up with ShinHan Touch Twin markers. I used a Prismacolor pencil or two to add blades of grass. Have you started thinking about your garden yet? I've started thinking about it, but haven't done too much else. Just thinking. Today the High Hopes designers are pairing up with Ribbon Carousel for a fun Blog Hop. Each of the High Hopes designers have used some ribbon from Ribbon Carousel while the Ribbon Carousel design team members have each used a stamp image from High Hopes. For my project, I chose the recently released Feathered Friends owl image. I pulled an old A Muse sentiment out of my stash for the banner across the bottom. I layered my sentiment banner over the pretty pink grosgrain ribbon I received from Ribbon Carousel. I also used some pink and white baker's twine to dress up the button. Now, hop along and see what kind of inspiration the other designers have in store for you today!! I made this snowy thank you card using a very simple, but oh so cute, snowman image I picked up a few years ago at Hobby Lobby. He was in a little 4 stamp set that was availble in their Christmas crafts section, and he remains one of my favorite snow fellas! I really love using the inverted scallop circle dies by Spellbinders. I didn't think I would use them as much as I have, but I really do enjoy them! They add a fun look, and are a bit different than a lot of other stampers use on a regular basis. Oh, and by the way, this card also qualifies for this month's Challenge Chicks challenge: SNOWMEN! You'll find this month's Challenge Chicks challenge gallery on SplitCoastStampers using keyword CHXJAN13 . We invite you to play along! Upload your project to your SplitCoastStampers gallery, add the keyword above, and your project will be automatically added to the gallery. Or join us on Facebook! Here is another card I made using the manger image from Inky Antics. The image is colored with pastel cool tones. The image colored with this sweet cool pastel colors coordinated really nicely with some of the Paper Loft paper I have on hand. I like the soft colors, and subtle shading. There's still time to enter the December 2012 sketch challenge being hosted by The Paper Loft. And, there's a BIG prize for one lucky winner! Find all the details on The Paper Loft blog! The current High Hopes challenge topic is to make a gift card holder or small gift box/bag. I chose to make a gift card holder, as I actually have a gift card on hand! I used the Small Stackable Santa image on the medalion, and tied the holder together with bakers twine. To create the holder, I cut a piece of cardstock 3" wide x 10.75" long. Make score lines at the 1", 5", 6", 7" marks. Fold the sheet so you create a 1" flap, and a 1" mountain fold in the center of the holder. Adhere the short center piece together, leaving enough space without adhesive so you can insert the gift card slightly. Using a punch or cutting blade, remove a portion of the center fold so the gift card can slide into place. I hope you'll join us for this week's challenge! It's not a bad time to get started (if you haven't already) on your holiday projects! Find all the details on the High Hopes blog. Alan and I want to wish each of you, and your families, a very happy Thanksgiving! We hope you are able to spend time with family, and fully enjoy the day. Happy Saturday!! I have a sweet little wintery card to share with you today. This adorable fox and cheery sentiment are from the clear Inky Antics set called Snowy's Woodland Pals. This is a small card, only 4x4, perfect for sending along some winter cheer. Coloring this card was quick and easy. Three marker colors and a bit of glitter. Easy enough! This weekend, I'm going to be making lists. Grocery shopping lists for Thanksgiving, along with holiday gift lists. I might even get out to the grocery store today, in hopes of beating the Turkey Day rush. I'm hoping there are some delicious yams at the store ... yams are on the menu for Thursday! Wishing you a wonderful day!! The current High Hopes challenge topic is to make a Christmas card using non-traditional Christmas colors (no predominant red/green in your project). This was fairly easy for me, as I use a lot of blues on my holiday cards. I used the Just Chillin' image from the recent penguin friends release. Love this little guy! I hope you'll join us for this week's challenge! It's not a bad time to get started (if you haven't already) on your holiday cards! What's a holiday without a little poop humor between friends!? I filled this empty spice jar with brown Jelly Bellies, and decorated the jar with a strip of designer paper. The image (by Inky Antics) was colored quickly with Touch Twin markers, and the tag was created using Spellbinders dies. The sentiment banner is just a narrow strip of paper with the ends snipped. Easy peasy! Paper: Neenah, The Paper Loft, Stampin' Up! The current High Hopes challenge topic is Feathers and/or Fur. I used one of the newly released High Hopes images. I really love how this card turned out! The image was really fun to color, and I expect to be using this image for more projects during the holiday season. I even pulled out an old favorite .... Fun Flock! I dressed the bear up in fuzzies, and gave the penguin some fuzzies, too! All those speckles on the snowman and ground ... that's GLITTER! This card has all KINDS of sparkle and shine! Ooooh, la la! Find all the details for this challenge on the High Hopes blog. I hope you join us! Saturday is the last day to enter the current Touch Twin challenge. The challenge theme is to create a Fall themed card, using monochromatic colors. This is a fun challenge to participate in, and I hope you join us! Get all the details on the Touch Twin Challenge blog. The stamp image I used on my project is from the set called Greeting Card Kids, by Stampin' Up!. The current High Hopes challenge topic is a color challenge to use Blue, Black and White. The current High Hopes challenge topic is a sketch challenge. I enjoyed the little extra touches the sketch prompted me to add to this card: three pearls (in the upper right corner - they're small!) and not just one, but TWO buttons on the sentiment banner. I used one of the new High Hopes penguin images and sentiments. This image of the penguin selling snowballs is one of my favorites from the recent release. The designer paper I chose to use is from the Everyday Life line, by The Paper Loft. Find all the challenge details on the High Hopes blog. I hope you join us! Saturday is the last day to enter the current Touch Twin challenge. It's a color challenge which is fun and easy to participate in! Get all the details on the Touch Twin Challenge blog. 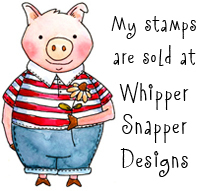 The stamp images I used on my project are from my "Farmgirl Betty" and "Farmer John" cling sets, available at Whipper Snapper Designs. I used various images from the two sets to create a simple scene that celebrates Fall. I thought the patterned paper from Paper Loft's Funkysaurus line looked so much like tidy, interesting garden rows -- making it perfect accent paper for my Farmgirl Betty card! It is time for the High Hope's Blog Hop to Celebrate the Penguin Friend's release! The High Hopes designers have created some fun projects to showcase the stamps that are being released today. The release includes 12 images, 1 background design, and 10 Sentiments illustrated by Laurie Furnell. There is blog candy along the hop. You won't know where, so leave a comment at each stop to enter yourself into the prize drawing! The blog hop will run through Midnight EST Sunday, October 7th (MY BIRTHDAY!!) with the winners of the candy posted on Monday, October 8th. You should have arrived here from Tina's blog. If you haven't, you might want to start at the top at the High Hope's Blog so you don't miss any of the fun. From here you will hop over to Lacey's blog! Have FUN! And enjoy the hop! Today is the second day of sneak peeks for the new stamp release at High Hopes Stamps. Here's a project I made to share with you today... I'm sooooo lovin' the new penguins! Today is the first day of sneak peeks for the new stamp release at High Hopes Stamps. Here's a project I made to share with you today... I'm lovin' the new images! Stay tuned for more projects shared this week! I've got a fun little announcement to share with ya! I was asked to be part of the Paper Loft design team, to create projects that feature their paper lines. Whaaa-hooo! How fun! The members of the design team are being announced one by one on the Paper Loft blog. I think it's a perfect fit for me, as their paper lines have a lot of my favorite colors in them. They use rich, earthy colors that are just perfect for the kinds of projects and cards I like to make. I'm excited! This month their Halloween paper lines are on sale, so I did a project using a few of their Halloween papers. You can bet that the spider print totally freaks me out. Ack! My absolute favorite line is Funkysaurus. Not necessarily for the one dinosaur print in the line, but for the fabulous colors and patterns of all the other papers in the line! Seriously ... so perfect for fall, boys, farm, garden, ... me! !